2. Melt butter in pan on medium heat. Once melted, add in flour and stir to mix. Bake off for about 2 minutes, stopping before it browns. 3. Stir in rosemary and chives, then add broth and milk. More milk will make thicker and creamier, more broth will thin it out. Allow to thicken and mix well. I just kind of eyeball how thick I want it. This Gluten Free Chicken Pot Pie is SO delicious & EASY!! 4. Mix in vegetables & chicken. Salt & pepper to taste. Gluten Free Chicken Pot Pie is ready to be assembled. 5. Add a splash of lemon juice to freshen up and bring out the herbs. You can certainly skip this step if you are not into lemon/pepper or lemon/rosemary flavor combos. 6. Transfer to a buttered (or sprayed) baking dish. Just add your Gluten Free Bisquick biscuits and your pot pie is ready to bake. 7. Spoon biscuit mixture on top. Gluten Free Bisquick makes a great crust for the GF Chicken Pot Pie. 8. Spray with butter spray or brush with melted butter if you want that golden brown on top. 9. Bake according to biscuit mixture directions. I love this recipe for so many reasons: it's quick & easy, it's a one dish wonder including protein, veggies and bread, it's delicious, and it is customizable-change the herbs, meats, veggies, etc. 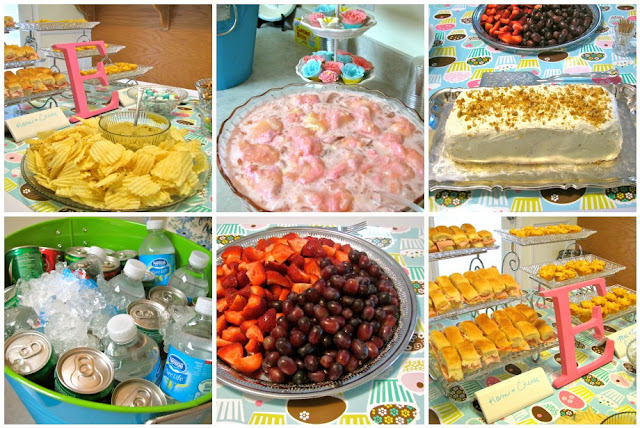 A couple of weekends ago, I co-hosted a baby shower for a friend of mine. Cupcakes seemed to be a theme throughout her pregnancy. For example, they used cupcakes with pink icing inside to reveal to the other kids that they were having a girl, and when they let the kids loose to pick out a new outfit for baby Emma, they decided on an outfit that had a cupcake on it. All of this left me with no doubt in my mind that the theme should be cupcakes. Since Emma's sisters were going to be at the shower, I wanted to do a little something special for them. At the Dollar Tree, I found 3 "Make Your Own Buttons" for $1. They were just what I needed. Each one said, "Emma's Big Sister" and went with the color scheme and cupcake theme. Since these could also be used later at the hospital, I didn't want to exclude the Big Brother who would not be attending the shower. In order to make it more masculine, his had a super hero. At Michaels, I found a great sale in the discount bins. Lucky for me, one of the items was flower, cupcake lip gloss!! Since I had added "flowers" to the cupcakes, I also found flower soaps in the bin that I put inside cupcake wrappers. They were the perfect colors too. I took tiered serving dishes and placed each lip gloss and soap on one of the trays. They became decorations that doubled as favors. I warned people as we opened the buffet that they weren't edible and then had them pick one out as a favor when they left. For the kids' favors, I bought candy filled Easter eggs that were shaped like cupcakes for them to take home. At Marshals, I found Cupcake wrapping paper that had all the right colors, which I used as the table runner. I placed flower ball ornaments inside candle holders to look like cupcakes and added them to the cupcake candles, a wooden "E" for Emma, and draping, pink tulle which was used to accent the food table. I made a banner that said "Emma Belle" (stay tuned for that tutorial soon) as an addition to the cupcake buffet. Plus, I found cupcake window clings and cardboard cupcakes from the Dollar Tree to accent the French doors behind the food table, the doors, and the mailbox. Since we had a cupcake theme, I had two choices for the cake - a cupcake cake or cupcakes. I decided BOTH! I told the local bakery about the flower/cupcake lip glosses and they were happy to accommodate by giving their cupcakes a flowery feel. 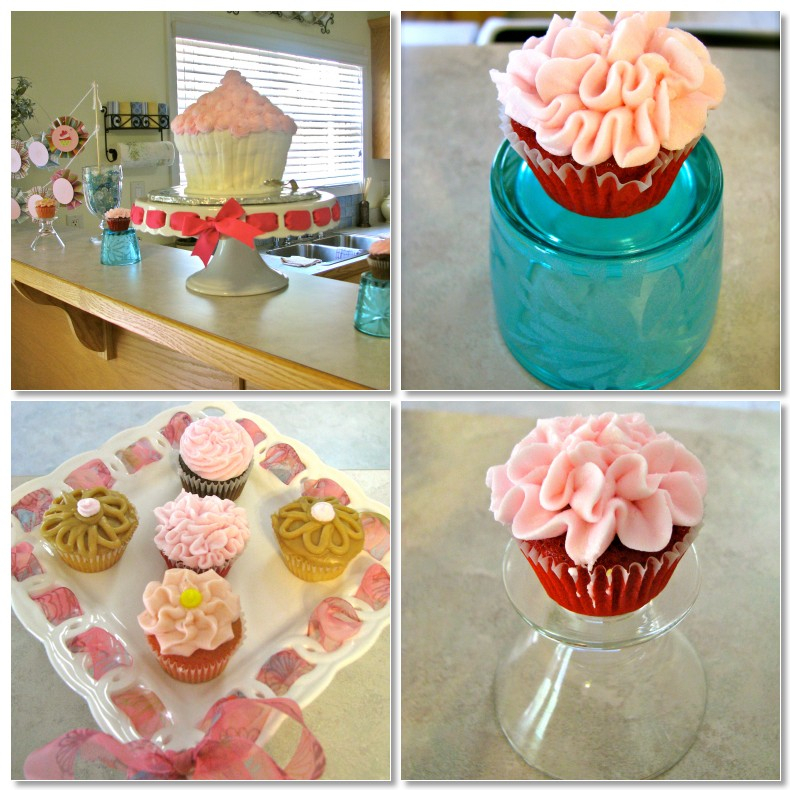 I sent them a photo of a cupcake cake that I found on Hostess with the Mostess so that they could copy it as well. They were all delicious and looked adorable!! 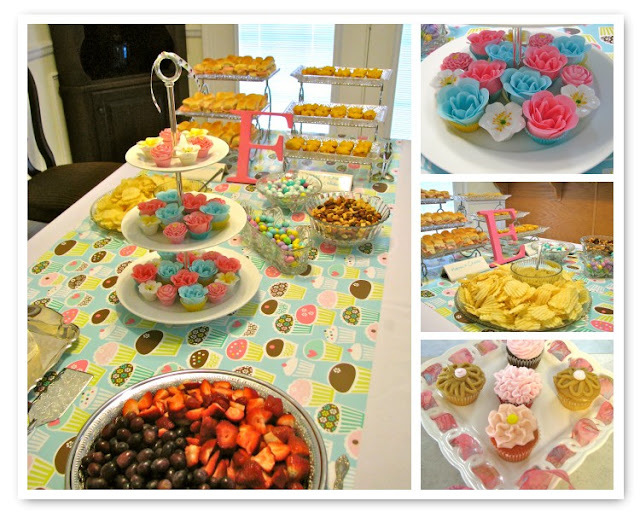 Since the shower was at 3 o'clock in the afternoon, we decided to do snack-like foods to go with all of the cupcakes. We served ham & cheese sandwiches, mac & cheese cupcakes (recipe from Macaroni & Cheesecake Blog - this recipe is always a hit!! ), a sandwich loaf (stay tuned for that recipe too), chips & hummus, a grapes & strawberries tray, nuts, M&M's, sorbet punch, waters, and sodas. The shower was full of excitement and gifts! Now we just can't wait for Baby Emma to get here and put everything to good use. 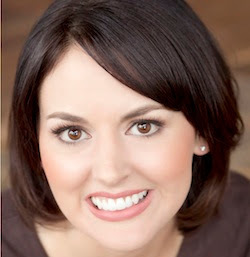 Congratulations, Melissa & family!! Thanks so much for allowing us to host your big event!! *Linking up to Saturday Project Linkup, What I've Been Up To Wednesday & Weekend WrapUp Party. Last month, I pointed out a simple, and I mean simple, way to organize all those store discount cards so that they would not only be out of your wallet, but would be easily found and not weigh down your keys. You can catch up with it here. Since then, that post has been making it's way around Pinterest. Others have commented and made the suggestion of using a keyring app for your cell phone. Like I said before, I do not use an app, so I do not have any personal experience and am not making recommendations, just merely answering some questions that have arisen on my post's pins. I have read that some store scanners are not able to read the barcodes and, therefore, the number must be keyed in by the cashier. If you have any experience with a loyalty card app, feel free to share your experience in the comments. Between spring break and hosting a baby shower this weekend, I am one busy bee. 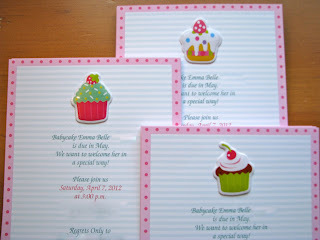 Just to give you a little preview of my babycake themed shower, I thought I would show you the invitations I made. I hope to get the full shower posted in the next couple of weeks. P.S. If you're using your vacation to surf Pinterest or Facebook, don't forget to follow us: Pinterest, Facebook.